Seminar paper from the year 2002 in the subject Computer Science - Applied, grade: 1,00, , language: English, abstract: This seminar paper was written in the summer semester 2002 during an English course, which was taught by Veronica Dal- Bianco B.Sc. RSA Dip. at the Fachhochschulstudiengang Informationsberufe in Eisenstadt, Austria. It is my intention to provide the interested reader with a complete and detailed overview of the new Web standard for vector graphics, SVG, which is the acronym for "Scalable Vector Graphics". 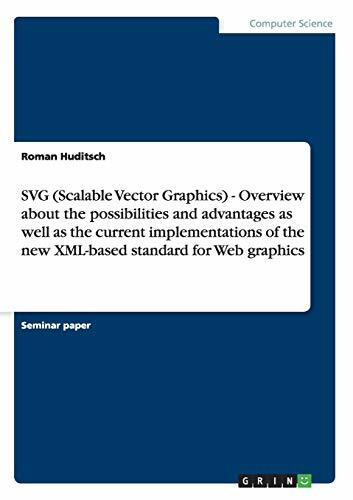 In the present paper important milestones in the long lasting development process of SVG are mentioned, as well as it states the numerous advantages that result from the useage of this new XML- based standard. Furthermore, an insight into the current status and availability of the most popular and interesting SVG implementations should be delivered. I might make use of some termini technici which are widely common in the XML and markup community, but may be unknown to readers new to this topic. Such terms can be found in a glossary contained in the appendix.